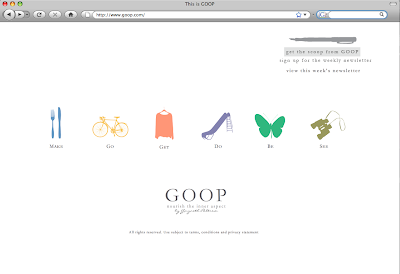 While more of an e-newsletter than a blog, I feel compelled to throw some positive attention toward Gwyneth Paltrow's website, GOOP (the name is based on her initials). Each week, she tackles a topic of her choosing from travel to child rearing to romantic recipes, and it's a fun read which I think would definitely appeal to readers of this blog. Poor Gwyneth has been taking quite a beating in the media for GOOP, including this article in the New York Times this weekend, in which she is accused of venturing into intellectual territory for which she has no qualifications as an expert. But I can't blame a gal for loving her life and wanting to share her thoughts with others, qualifications or not. In fact, I can relate.